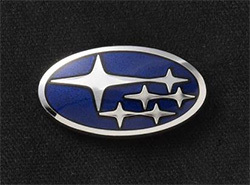 Tokyo, March 31, 2017 – Fuji Heavy Industries Ltd. (FHI) is changing its company name to Subaru Corporation with effect from April 1, 2017. To mark the change, renaming ceremonies were held today for employees at the company’s Head Office in Ebisu, Tokyo and three other domestic facilities. *1 The all-new Impreza launched in Japan in October 2016 and a large-scale model of the advanced variant of the 412EPI helicopter were displayed at the Head Office ceremony to symbolize Subaru’s commitment to growth as a distinctive global brand in the automotive and aerospace industries. Commemorative leaflets and newly produced Group lapel pins (pictured below) were distributed to employees. Based on our management philosophy of aiming to be a compelling company with a strong market presence built upon its customer-first principle, we will aim for further sustainable growth by magnifying our efforts to continue bringing our customers the distinctive Subaru value of “Enjoyment and Peace of Mind,” which we have cultivated over many years.